2) Decide on the total USA dollar amount that you would like to give. 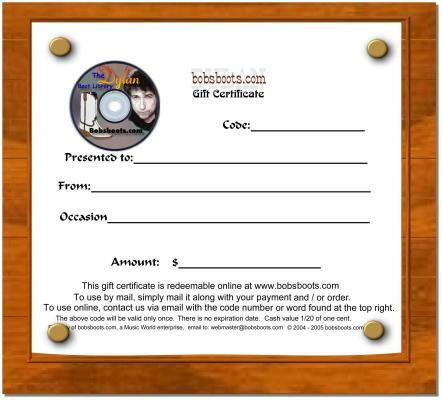 3) Make a secure payment to bobsboots.com by clicking the button below. IMPORTANT: Be sure to type in your code in the note section, or elsewhere on the payment page. Download the gift certificate by clicking on it below. Save it to your system. Open it, and print. (re-size if needed). If you are not familiar with downloading and printing images, you can make a low resolution copy by simply printing this page and clipping the gift certificate out. Fill out the information. IMPORTANT: Be sure to write your code correctly on the certificate.